Read Hal's sermon from Consecration Sunday, Blessed. Hi, I’m Curtis Wray and this is my wife Jackie and my daughter Faith who will be 3 in December. Faith has been asking all kinds of questions — as you would expect from a 3 year old. Lately, she is really interested in money. “How much does this cost?” and “This is five dollars — that’s a lot.” She’s also started to want to buy things on her own. We want to encourage our budding economist and help her to understand the value of money. Right now, we think that she gets the transactional nature of money — she gives the cashier her dollar and she gets an applesauce in return. She calls church God’s House and at one time asked if Hal was “God” — but that’s another conversation altogether. Anyway, she hasn’t asked how much does God’s House cost yet, but if she does it will be a chance for us to talk about how God’s House is free to all, but we choose to give money to church. And then perhaps, we can talk about this money supports the music, and the worship, and the building where she gets to see all of her God’s House friends every week. But, we’ll tell her, that isn’t why we give money. We give money because we love Plymouth and we are responding to our own gratitude. She may not get it at first, but eventually she may understand that Plymouth is not a pay this, get that in return transaction. It feels strange to say it, but when we first moved to Fort Collins and joined the church, we felt that giving to Plymouth was purely transactional. We gave a monthly amount, and that amount was determined by the value that we felt we were getting in return. A weekly organ and choir concert, check. An interesting seminar on Biblical history, check. Even the feeling of worship and peace that we felt during the service, check. We were taking the toddler view of offering and pledges. Ironically, today more than ever the tangible benefits (such as childcare and Sunday school) are much more utilized by our family. But, just like Faith will learn, we’ve come to realize that a Plymouth pledge isn’t just a way for us to pay for a product. It is something that we do in response to God’s love and something that we do as an act of gratitude. I recently taught the Middle School Sunday School about ministry. I feel like one way that our family does ministry is by supporting Plymouth with our offering. Plymouth’s ministry is an extension of our own ministry. It is a response to God’s generosity. Our Plymouth pledge brings us closer to our church, closer to our church family, and closer to our church’s ministry. For us, in so many ways, generous giving from a place of gratitude makes Plymouth truly God’s House. 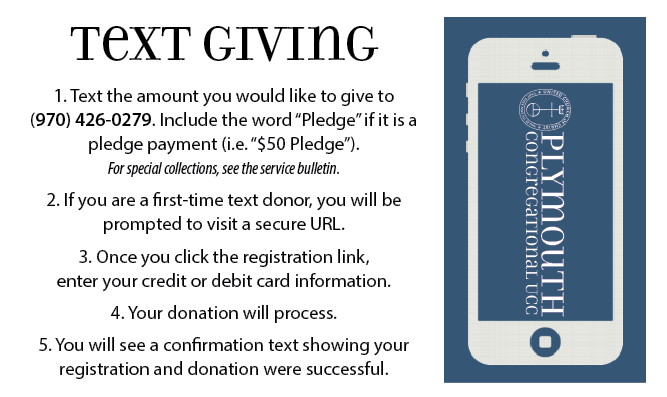 How do I give via text? What the best way to give regularly? How do I learn about Planned Giving? ​tap the blue "Give" bar. Click to give online right away (= Quick Give). * Or type in TinyURL.com/PUCCGive​. ​your card information each time. Note that seasonal giving funds (like "One Great Hour of Sharing") will be announced in the bulletin. Set up ACH withdrawal using the linked form (print, fill out, sign, and return).